Want to learn how to plan a fun night out at the theater for your group? Join us before work Weds 3/27. 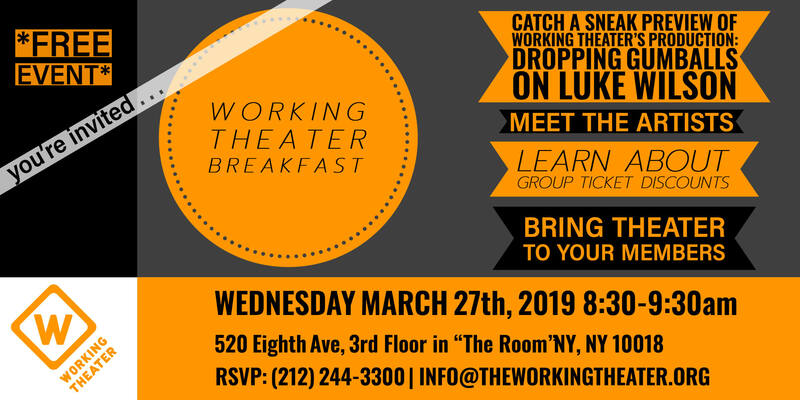 Enjoy a light breakfast, hear a short scene from Working Theater’s upcoming production,”Dropping Gumballs on Luke Wilson” and learn how to get deep group discounts when you bring a group of 10 or more from your union, school, church or club. “Gumballs” is inspired by a true, little-known story about the making of an iconic TV commercial, in which a legendary film director puts a movie star’s life in the hands of a very nervous props guy. Written by Rob Ackerman (who also penned Working Theater’s acclaimed production of “Tabletop”) and directed by award-winning theater artist Theresa Rebeck. A humorous and ultimately disturbing account of power in the workplace, “Gumballs” examines how truth is negotiated in both art and in life and who gets to control the narrative in an increasingly divided society. a great way to spark dialogue among your group!